Hiking in towards McGonagall Pass in perfect weather. In 2011 I was invited to climb the Muldrow Glacier route on the north side of Denali. 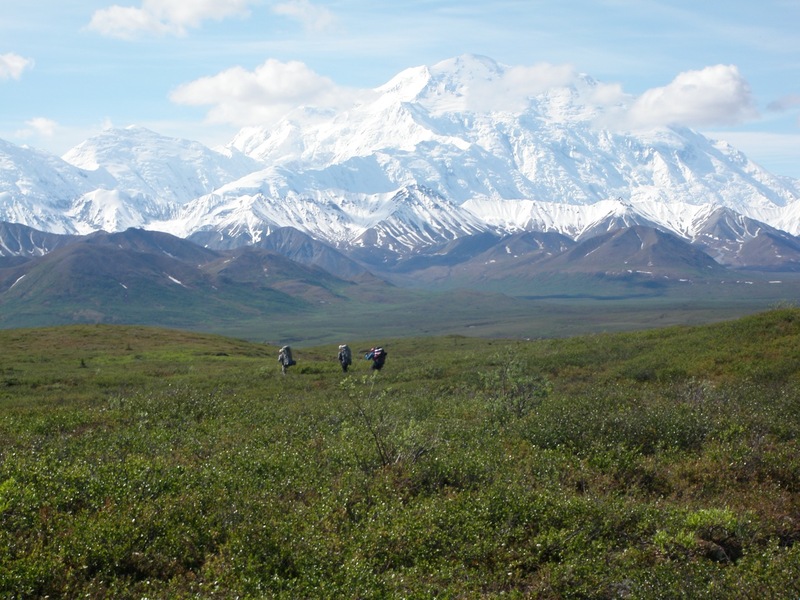 Our team was led by a permanent Denali climbing ranger and 5 volunteers (including myself). We had the best of times and some exciting times but I could ask for a better team or a better experience. We marked some trash, rescued a team that was in over their heads, and got to summit the less regarded, but more remote north peak of Denali. It was a full Alaskan adventure, complete with a portfolio of memories I hope I never forget. If you are planning to complete this route, I hope you find these posts useful- please feel free to email me if you have further questions about recommended logistics or my experience. This was the 3rd time I have volunteered with the Denali National Park climbing ranger team. Every time has been a privilege and an adventure, and every bit as good as I could have hoped for. We got dropped off at Wonder Lake on June 16th, 2011 and flew off the mountain 28 days later on July 13th. We crossed the McKinley Bar the morning of June 17th in high, but not impassable conditions, and made it to McGonagall Pass on the afternoon of June 18th. Other parties had left a melted out trail up the glacier, and we had a beautiful, but relatively uneventful trip up to the base of Karstens ridge. Gaining the ridge required the use of a fixed rope and ascent of 70° terrain to avoid avalanche hazards on shallower slopes. Until gaining the ridge we had enjoyed stable weather and warm temperatures, however once on the ridge the weather became less predictable and we moved less predictably. We assisted in rescuing a team off the route at Browne Tower (14,600′), and our team remained strong even at high altitudes. We camped one night on the upper Harper glacier, then completed the traverse to 17,200′ on the West Buttress route on July 4th. After several rest and weather days, we pushed for the summit on July 7th. Myself and 3 others summit the North Peak of Denali at 7pm that evening, while 2 others summited the South Peak at 5pm the same day. We decended the West Buttress and packed up the NPS camp at 14,200′ over the following days. Flying off gear and people was delayed due to hazardous weather and our exit ended up being just in the nick of time.